Topics: Tables, Cupboards, Chests, Shelves, Cabinets, and Hutches. 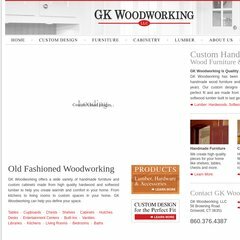 gkwoodworking.com GK Woodworking : Hardwood Lumber, Handmade Wood Furniture, Custom .. It is hosted by Network Solutions Llc (Virginia, Herndon,) using Microsoft-IIS/6 web server. It has 2 DNS records, ns91.worldnic.com, and ns92.worldnic.com. The site is programmed for ASP.NET.